The Titans seemed helpless on Sunday in Minnesota, as they could only sit back and watch themselves being beaten to a pulp by a young Minnesota team. The result – a 30-7 loss that didn’t indicate just how bad it really was. The Titans wake up Monday at 1-4, and with a Thursday night game vs the Steelers this week, the 2012 season looks like it could get even more ugly than it already is. Matt Hasselbeck, who started in place of an injured Jake Locker, was 26-for-43 passing for 200 yards and a touchdown. Chris Johnson had another poor performance for the Titans, who are 1-7 all-time in Minnesota. They made none, and couldn’t stop Percy Harvin, the Vikings top playmaker who went off for eight grabs for 108 yards and a touchdown and also rushed for a score. Johnson never got going in a run game that is totally void right now. He ran for just 24 yards on 15 carries and fumbled once. Harvin’s 4-yard touchdown run gave Minnesota a 7-0 lead with 2:31 left in the first quarter. Earlier in the drive, Christian Ponder connected with Harvin for 45 yards down the left sideline to put the ball on the Titan’s 16 and four plays later Harvin took the handoff, broke a tackle, and lunged across the goal line for the score. The Vikings were forced to settle for yet another Walsh field goal, this one from 26 yards away, after a 12-play march stalled at the Titans’ 8 with 5:07 left in the third. Ponder found Harvin on 3rd-and-5 for a 10-yard pass to put the Vikings up 20-0. Harvin caught the ball in the right flat and made a series of Titans’ defenders miss before waltzing into the end zone with five seconds left in the third. 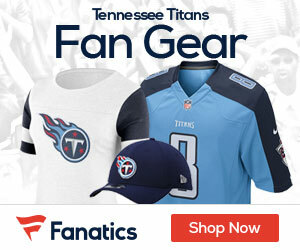 Tennessee countered with a 10-yard score of its own on the ensuing possession as Hasselbeck found Cook in the end zone, capping a 12-play, 77-yard drive to get the Titans on the board for a 23-7 game. But the Vikings marched right down the field and Ponder connected with Kyle Rudolph in the end zone for a spectacular 15-yard touchdown-catch. Ponder floated the ball towards the back boundary and Rudolph, who was draped by a pair of Tennessee defenders, leaped and came down with the ball, putting the game out of reach for the Titans. Tennessee is at home for the Steelers Thursday night.